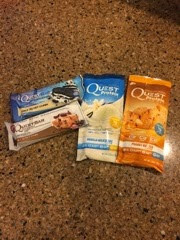 I tried the Cookies & Cream and Chocolate Chip Cookie Dough Bar, as well as the Vanilla Milkshake and Peanut Butter Protein Powders. The bars were the best tasting protein bars I've ever tasted. Now I know what all the talk I've heard is about. The bars tasted great while not being filled full of junk like other protein bars. They were also relatively low in calories and didn't taste overly sweet. The protein powder is high quality and I believe you can taste this within the first few sips. I love that they are pretty low in calories, but still contain a lot of protein. I noticed my muscles were less sore than usual after my workouts and truly credit this to Quest Nutrition's protein formulas.